This Social Games Guide unpacks the wide-ranging category of social, skill and/or casual games available online. This guide lists the Social Games network sites, types/genres of games plus ways to play whether via browsing gaming sites, mobile devices, apps or purchasing your own version to play on your PC. Lastly, Virtual Currency, Pay to Play, Bonus Rewards & Promotions are reported. Social Games refers to playing online games that allow or require social interaction between players, as opposed to playing single-player games. Enter Social Gaming sites and networks like Gamervision, Zynga, Wooga, Bigpoint Games, Gameforge, Goodgame Studios, MegaZebra, Vostu, Playfish, Plinga, Playdom, Kabam, Crowdstar and RockYou. Also, AOL’s top partners include Arkadium, Big Fish Games and Masque Publishing. The top 3 search engines, Google, msn/Zone, Yahoo along with Facebeook have also jumped into gaming territory. Currently, 65% of play has shifted from web browsers towards mobile and tablet devices and stats reveal that there are more than 1.5 billion mobile gamers worldwide. Let’s start with a general overview of Social Games online to include popular sites, game titles, mobile social games and game apps. GamerVision, a Social Games community has passionate gamers connected all over the world. It features user created video game reviews, previews, groups, blogs and forums. Ugame creates a platform for gamers to connect with friends, upload photos, share videos, support their favorite clubs and manage their daily online gaming activities. GAX Online is a simple site design that gamers can use to establish connections with other like-minded gamers to share snapshots and videos plus their progress notes. Second Life Profiles is a site devoted to second life gamers; they have privilege of meeting the geniuses behind the second life avatar. Social Games Guide reports that the game titles released in 2014 has created a fascinating and mind blowing experience to the diverse fans of online games. Platinum Fashion allows each player be a cover model and is composed of Tumbling Reels and Mystery Bucks. Disco Nights is another land-based casino through IGT, and players can enjoy the 70s hair, fashion and music. The game also features lucky symbols and enticing free spin bonus. Enchanted Realms is a social play casino and comprises fan-favorite super symbols. Moonlit Mermaids is the first game to break the monotony of playing online games on a single platform, this game can be played on both Shake the Sky Casino and High 5 Casino. One of the trending game titles of 2015 is Wildstar that is a free to play fantasy MMORPG with an amazing animated theme. The game features explorers, soldiers, scientist, and settlers trying to find their way back to the newly discovered planet of Nexus. New and established gamers can explore the mobile social games world with ease via their smartphones and tablets. Whirled is an exemplary collection of hundreds of games. Whirled differs from other Social Games in that much of the content is user created where users are encouraged to create furniture, characters, and decals or a game package. An example of a created game at this site is Orbitz. To experience the best of 3D games consider downloading Moondo app. A simple click on the game of interest and you are good to go. Apple apps store has an ‘appetizing’ variety of game apps. Instant Action app offers a classy platform to play sophisticated 3D games online, that aside chatting and connecting with friends is provided. Install ActiveX and enjoy diverse games. CrowdStar is a Social Games app for women all around the world. Covet Fashion app allows your creative side to shine by styling head-to-toe looks with actual recognizable brands like Rebecca Minkoff and Rachel Zoe. It’s like having an infinite closet of luxury fashion at your fingertips. In the past, skill games were well established and named as ‘true skill games’. Examples are rummy, chess, checkers, backgammon, puzzles, word games, dice games, tile games, card games and even darts and billiards. Dig deeper into the categories and you find gin rummy, oklahoma, canasta, scrabble, crosswords, mahjong, dominoes, pai gow, craps, yahtzee plus many versions of poker. These types of games are detailed extensively at the gamerisms site along with this Social Games Guide. These skill games are now available online with single and multi-player options, but have now expanded beyond the imagination with hundreds of choices and types/genres of games in addition to the standards mentioned. Of course, additional choices and games is always a good thing for passionate gamers and most welcome. Wildstar, Real-Time Strategy (RTS) requires the player to develop his/her own inventory of items, symbols and armies. The game is played in real-time thereby allowing multiple participants for Age of Empires, StarCraft and Sins of a Solar Empire. For those who like to tackle hard puzzles, Tetris is a good example. First-person shooter games are designed to give players an opportunity to display their talents individually or on a team with games like Counter-Strike, Halo and Unreal Tournament. Combat games provide the player with a chance to fight one-on-one with opponents at a close range and in person. Examples are Aggressors of Dark Kombat and Arcana Heart Series. Casino Games: poker, slots, video poker, bingo and keno. Almost all Social Games sites offer this genre. Card Games: types of card games have developed into a multitude of poker-based games including the ‘takes’ type where a single card play from the hand, based on the values of played cards, one player wins or ‘takes’ the trick. Examples are Bridge, Whist, Euchre and Spades. Board Games: played with counters or pieces that are placed, removed, or moved on a pre-marked surface according to a set of rules. Role-Playing: games where players assume the roles of characters in a fictional setting. Role-Playing Live: players physically act out their characters' actions. Miniature Gaming: utilizes miniature figures, miniature armor and modeled terrain. Alternate Reality Games: provides a platform to explore possible situations and social interactions while steering clear of real world consequences. No Victory: these games are played frequently; the game never ends and remains without a winner but rather present players with a quest or mission to complete. Game genres are Hidden Object, Time Management, Match 3, Adventure, Family, Arcade & Action, Strategy, Word, Brain Teaser and Sports/Racing. For additional games that use web browser as a client, there is Legend of Empire that provides a multiplayer gaming environment. Pac-man and Frogger were launched back in the 1980s. MUDs is a multi-player game dating back to 1978, it was replaced by MMORPGs. Examples are Dungeon Master and Colossal Cave Adventure.Games that boast historical popularity are Bejeweled, Candy Crush, Farmville, Happy Farm, Mob Wars, CityVille and The Sims Social. While they share many aspects of traditional video games, social network games are created to lean towards the casual games category. HTML5 games that can be played in web browsers, however, the trend is moving quickly to mobile gaming. User-friendly ways-to-play options are PC Games, Mac Games, Online Games, iPad & iPhone Games plus Android Games. Mobile Skill Games: Games you can play on your iPhone, iPad, Androids and other mobile phones of tablet devices. Online Skill Games: Free online games you can play in your web browser. 1) An impressive game inventory of titles offered in multiple genres available for play or purchase. 2) An equally impressive number of game sites and/or social networks presenting a sizeable number of game titles and choices. 3) Several methods of play via game sites, mobile devices and game apps. 4) Daily, Weekly and Monthly promotions include 50-70% off, play for free, special bonus promotions plus loyalty rewards and/or virtual currency. 5) Exclusive or proprietary games played at certain social networks or via mobile. 6) Game developers are eager to introduce exciting new games to players giving gamers the bragging rights to state, “First to Play”. 7) 24/7/365 customer support plus major languages are spoken to the benefit of players worldwide. 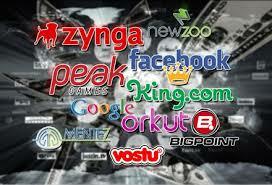 Social networks use virtual currency that holds no value in real money. Virtual currency is used to buy in-game goods. Players are usually required to provide real cash that is converted to the game site’s virtual currency. Eventually they can buy land, supplies and other items to strengthen their status and add points. However, some virtual currencies are time-based depending on measurement of in-game achievements in order to accumulate redeemable points. The use of Virtual currency is limited to the site where you paid upfront since they are specific to each game. Most networks are now offering games for either download or purchase, for example at PopCap Games you can download the full version or pay a small monthly membership fee to play unlimited games. Zone/msn games offer subscriptions for either a monthly rate to play and access unlimited games with no ads or monthly rate to purchase your own games/software. Loyalty rewards are called charm points. In addition to offering bonus points, most sites offer welcome bonuses and loyalty points to new users. These points can be used to play more games and to purchase upgrades that make the game interesting. The points are redeemed by clicking the redeem points icon available on site. The moment players sign up at the online Social Games website, he/she becomes a member of the loyalty reward program. Loyalty points are awarded depending on the amount of time spent playing and the levels reached. Tournaments are also available, and a player can take part in multi-player slots competitions for big prizes. In most countries, skill/social/casual games do not constitute gambling because they involve predominantly skill, as opposed to chance, and are designed as interactive online entertainment for adults. Participation is restricted to individuals of legal age in their respective jurisdiction. Players must also meet criteria for location eligibility in order to participate.